Inside Passage . . . This true story takes us from the bottom of New Zealand to the top of Iceland. From the backcountry of New South Wales to the canyons of southeastern Utah. From the heart of Athens to the mountains of Colorado. From the secluded lanes of an English village to the crowded highways of the City of Auckland. From a relaxed Kentucky town to towering glaciers in Alaska. More importantly, this story takes us on a journey of spirit. From heavy religion to lightness of being. From success and confidence into loss and despair. From doubt and resentment to restored faith and purpose. This is not the story of a great life. But few of us live great lives. Some narratives of small lives need to be told, to stimulate discernment for the pattern and meaning of our own lives. In part, this book also tells the story of a Christian community of faith, from one adherent’s perspective. Pieces of that community’s experience through 150 years of its history emerge, with acknowledgment of the weakness and the shadow as well as the power and the glory. You will experience brisk writing, touches of humor, and story upon story. 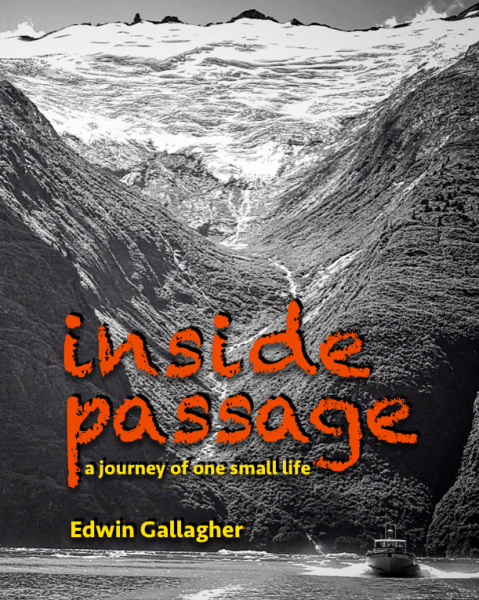 No matter where you are in your spiritual journey, the account of Ed’s inside passage will inspire and encourage. From a reader … "Loved the spiritual memoir. I couldn't stop reading it once I started—a remarkable journey. . . . I smiled, laughed out loud and teared up. . . . Thank you!" - Mac users … The eBook (ePub) version, when opened, will install into iBooks on your computer. - Windows users (also applicable to Mac) … If your computer does not have a reader application, try Adobe Digital Editions, a free download . - Once you have the eBook on your computer, you can sync it to an iPad or similar device if you wish. Powerful texts of the Bible ? This treasure is like nothing you've seen before. Especially helpful for people who are new to the Bible or off-track with their study experience. This compilation of Scriptures provides a superb way to discover the joy of the Word. It takes you through the Good News story of the Bible from Genesis to Revelation, using Scripture selections you might expect, plus hidden gems that will surprise. No commentary … just the Word, representing six different English translations. Let the Spirit speak to you and bless you! Scriptures fall into eight themes: Godhead-Holy Spirit . . . Messiah-Christ . . . grace-gospel . . . choice-destiny . . . church-mission . . . faith-challenge . . . prayer-praise . . . relationship-holiness. Themes are color-coded … you can choose one and follow it easily. Color illustrations help drive Bible messages home. A total of 365 selections suggest reading and praying over one Scripture passage a day—for a great year in your life! Ideal for group study as well as personal study. In your group or family, choose a theme and follow it through. Looking for the Spirit Gifting guide ? > A 27-page, full-color workbook. 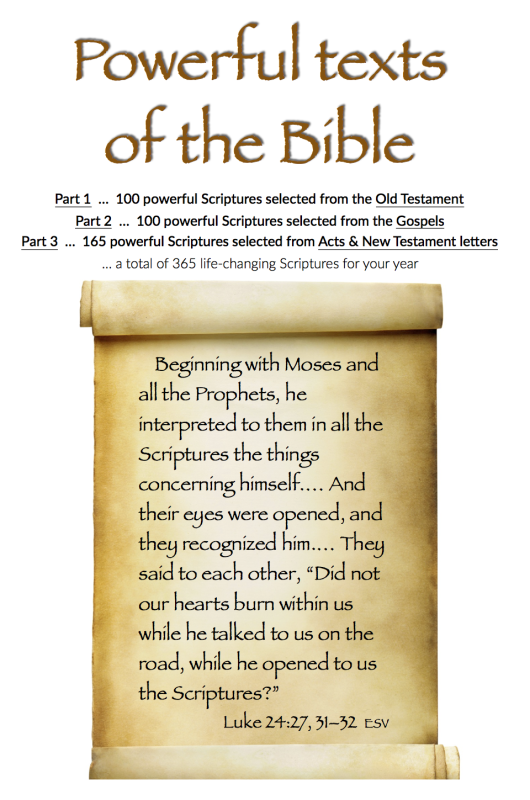 > Features 10 “anchor texts” in the Old and New Testaments that descibe the gifting of the Holy Spirit— some of these Scriptures are hidden and surprising. > Not for casual readers! 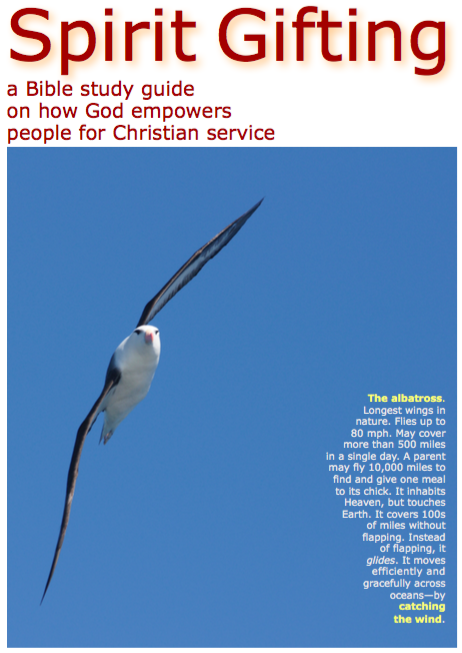 This workbook is for those who want to spend time in the Word of God to learn about how the Holy Spirit empowers people for Christian service. > Designed for individual study or group study. > Verbal and photographic illustrations throughout. > Plenty of opportunity for personal response and group discussion. You may be a disciple and you might feel called to minister. But how? What about your uncertainty, weakness and inability? 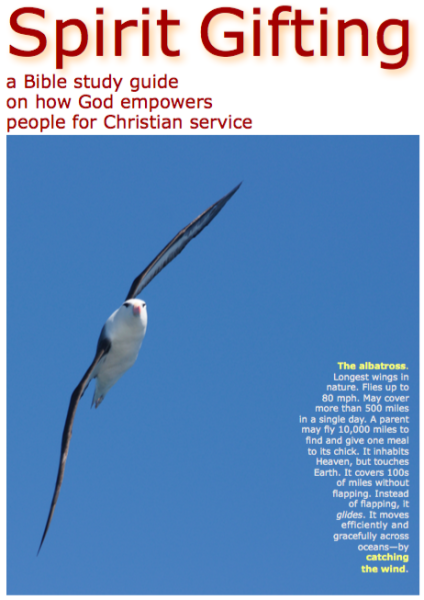 This unique workbook shows how God gives us tailer-made ability—through a mysterious process called Spirit gifting. You will find a non-traditional and unexpected approach to this subject—drawn completely from Scripture itself. Whether God wants you in a quiet, supportive ministry, or in an out-front role of some kind, you will see how Heaven can use you in a significant calling here on Earth—right where you live and work and worship.